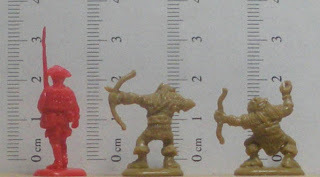 The latest set of orcs from Dark Alliance (PAL72002) are very similar to their previous group of orcs. There seems to be a few more of the smaller Moria orcs in this set, and indeed, the sculpting of the facial features for them is more goblin-like than for the larger orcs. The figures have some granular flash on them not found in the previous set, but it is easily cleaned up for the most part. Also included in this set are two archer poses. 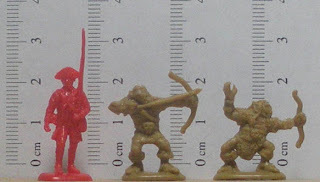 A comparison of plastic orcs in 1/72. These aren't bad! I get tired of the usual GW or WoW looking orcs. Oooh! They're out already! I havent gotten the first box yet and this is out too! Thanks for the review, I'll be getting these soon.